Star FM Tamil Radio Sri Lanka Live Streaming Online . It broadcasts Tamil Hit Songs 24 by 7 Online . 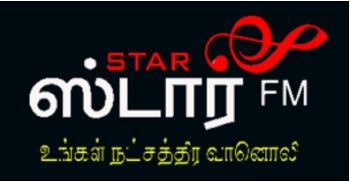 It broadcasts A R Rehman Hits , Ilayaraja Tamil hits and all Famous Tamil Music director Songs . Head Office: 112/40, Union Place, Colombo - 02.